The role of a think tank is – in large part – to make potentially dry subjects interesting, engaging and impactful. But just sometimes, our job is the opposite. It is to try and help temper subjects that have become so divisive that it is hard to make reasonable progress. So we have sometimes sought to stoke debate on issues where there has seemed to be a stifling consensus – such as on the new Welsh student finance system or on the impact of selective schooling in educational progress. On some other issues, our approach has been precisely the opposite. There are topics which are so fraught, so full of tension and so disputed that policymaking would benefit from a dialling down of the temperature. So, while,Ministers were attacking universities for supposedly encroaching on free speech, our paper on free speech on campus took a more sober and subtle approach. It was designed to be of real help to those inside institutions dealing with the practical day-to-day challenges of protecting free speech while also ensuring student safety and staying on the right side of the law. 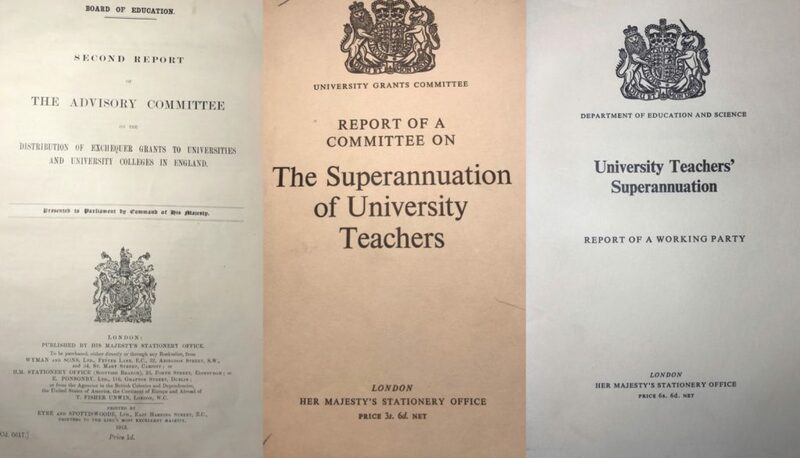 Our new report on the Universities Superannuation Scheme (USS) is of a similar ilk. It takes a divisive and controversial issue, looks at it in a different way to the vast amounts of other recent commentary – that is, through the lens of history – and then tries to explain how current tensions have come about. The paper goes back more than 100 years to look at the origins of university pensions – Owens College in Manchester (a forerunner of the Victoria University of Manchester) had a Scheme from very early in the twentieth century. It then takes a detailed look at the period between 1958 and 1975, during which two under-researched reports from the great and good and other work laid the foundations for the USS. For over three decades afterwards, all was relatively quiet but, since 2011, the future of the USS has been a subject of fervent debate and even large-scale industrial action, which is currently on pause rather than concluded. While the new paper briefly covers the recent arguments over the valuation of the USS and its deficit / surplus, we don’t get bogged down in the technical details that have played out in enormous, sometimes turgid, detail elsewhere. This is because we actually want people to read our report. (That’s not a dig at the Joint Expert Panel, headed up by Joanne Segars, who was once my boss and one of the best bosses anyone could ever hope to have.) Instead, we try to stand back, to see the wood as well as the trees. The prescience of the main trades union who, for example, long before it was widely accepted, called for things like the inflation protection of pensions in payment. The generosity of university employers, who have regularly pushed for better pensions for their staff and sought to be generous, lobbying policymakers, finding resources and agreeing to take on the burden of increased costs. Concerns about public relations issues linked to the renumeration of senior staff, as one driver of the conversations that led to the USS was a fear top-up pension schemes for senior staff could look excessively generous. finding the right balance between university pension arrangements and the state. The historical approach also shows how much the starting point matters. if employees choose to make use of the new option of only paying 4 per cent in future, they will be paying less than back in 1913 while employers will be paying nearly five times as much. When HEPI takes a cold topic and heats it up and when we take a stiflingly hot topic and cool it down, the aim is the same: to make people think – which is after all the primary role of a think tank. Earlier this week, the Charity Commission noted the responsibility of educational charities to be even handed, which our paper tries hard to be. If you disagree or know a better approach, do leave your comments below. ← Thoughts from HEPI/AdvanceHE House of Common’s Seminar: Boom or bust? How can institutions – and the regulator – best respond to the new market pressures in HE?